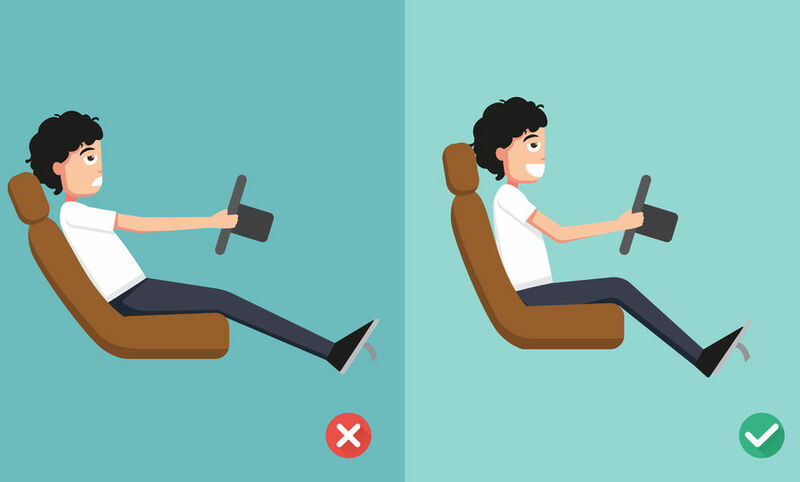 There are two main points to keep in mind when you set up your best car posture. In the car safety industry such as the Insurance Institute for Highway Safety, your safety is paramount. The main goal for them is to see you survive a collision. Sometimes this means comfort is sacrificed. With that in mind you can still position yourself to best support your body and avoid bad posture while you are cruising down the road. Good posture during driving can reduce neck, back, shoulder and buttock pain. I don’t encourage long drives without breaks as sitting for any length of time greater than 20 minutes is not ideal for anyone. I do know that a lot of people commute and need to make the most of their posture while driving. So here is a breakdown of the best car posture. Some car seats are deep and lack support. More vehicles are fitted with inflation devices built in to create support. Still, I feel that most people do well with an added support such as a pillow that can be shifted from lower back to below mid-back. The goal is to lift the rib cage and avoid the low back from collapsing toward the seat. One secret to reducing stress on your low back is to make sure the bottom seat allows your thighs to be around 100-120 degrees to your body. This minimizes the pressure on the delicate discs in your back and keeping muscles relaxed. Be sure that your head is supported by the head rest. Keep the head rest in the correct safety position. Your arm and thigh position should be relaxed and in a comfortable angle to minimize strain and pressure. The best car posture is ultimately one that incorporates alignment and safety. Ideally it minimizes the amount of time actually sitting in the car. Life is motion so be sure that the car is not the only one moving. On long drives take a break when you can, it will make your driving experience that much better. Learn more about proper sitting posture.